Natural health ingredients are gaining more popularity worldwide. They are often added into products good for health but poor in taste, while common flavoring ingredients such as sugar or other carbohydrates are used in reduced quantity or removed completely to lower calorie intake. To maintain a pleasant taste while keeping the product at a low calorie level, phloretin could be an excellent flavor modifier with low intrinsic taste for masking bitterness and enhancing sweetness. 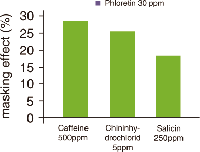 In contrast to most natural flavor modifiers, phloretin shows strong masking effects towards compounds with unpleasant taste, such as caffeine, salicin, and quinine. 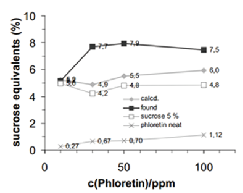 Very weak sweet-tasting phloretin features much higher sweet enhancing effects expected by simple addition.